Accountability is a vital aspect when it comes to budget planning. 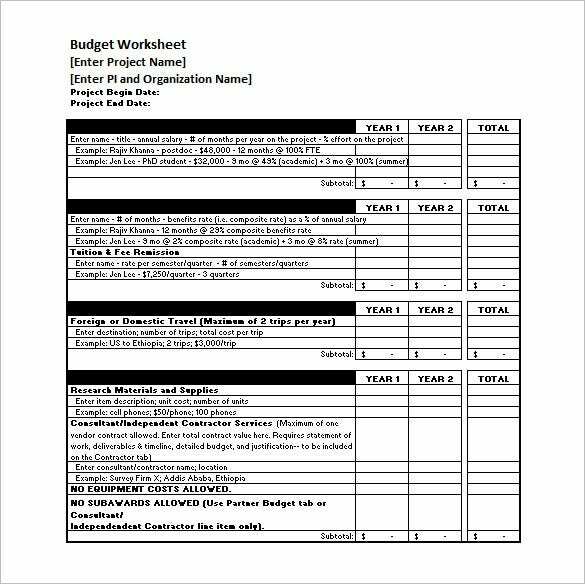 Whether you are budgeting for your business or building a home shopping list, sticking to the use of a proper budget timeline is both a sign of accountability and a powerful way to avoid unnecessary financial hurdles. 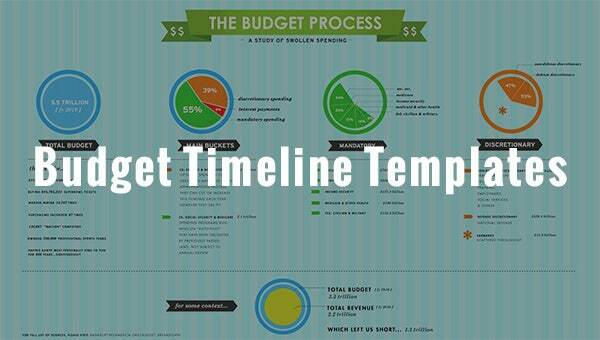 dil.berkeley.edu | This budget process timeline sample covers the major expense areas in a business such as travel, research materials & supplies and so on. 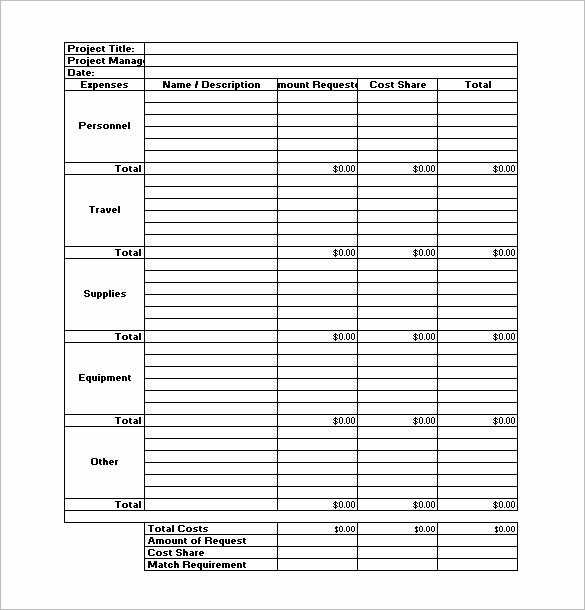 The left side lists the expense areas and the right side documents the time & total costs. 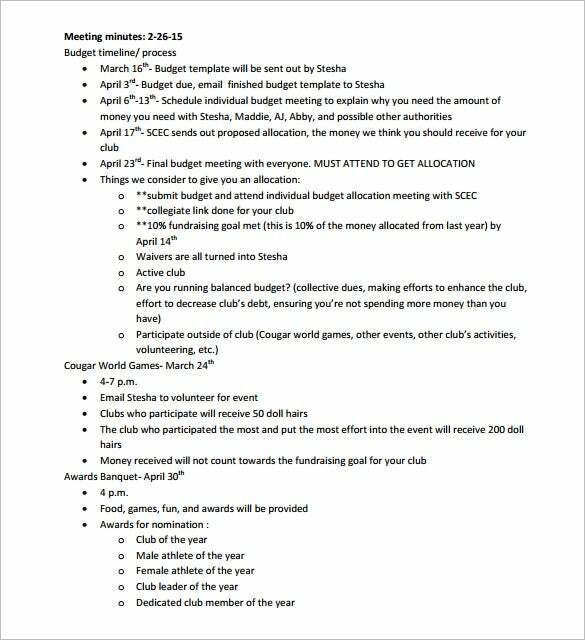 You are getting a detailed budget timeline here. The left side talks about the fields of expense while the right side deals with cost per unit, total cost, contribution etc. 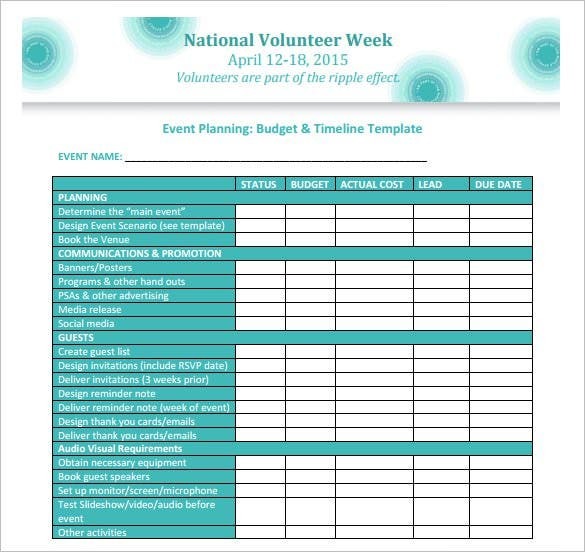 volunteer.ca | This is a basic and standard budget timeline. The left part of the template lists down the different areas of expense while the right side talks about status, budget, actual cost, lead & due date. This federal budget timeline spans a wide time period starting from early fall of one year to October of next year. 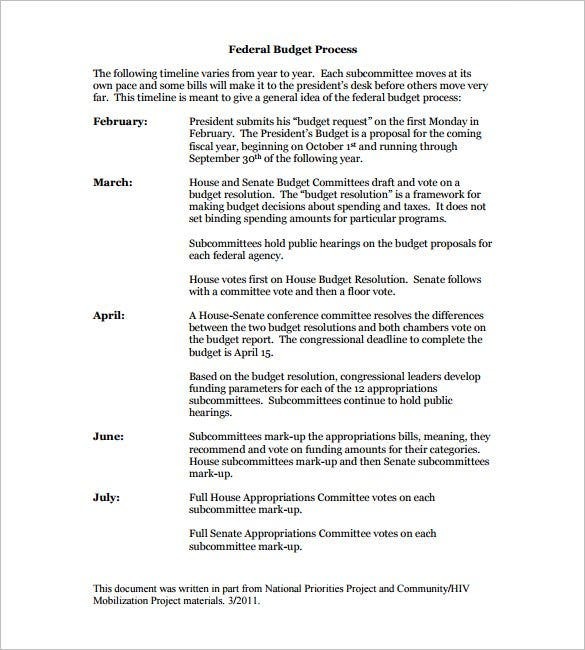 The entire timeline is presented in textual format with documentation of the budget process throughout the months. 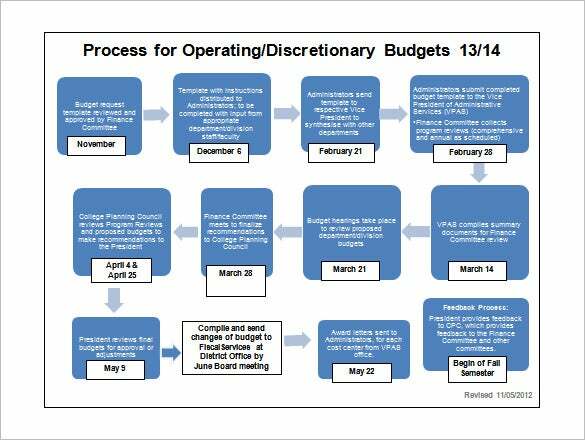 This budget process timeline covers a timeline of 5 months. 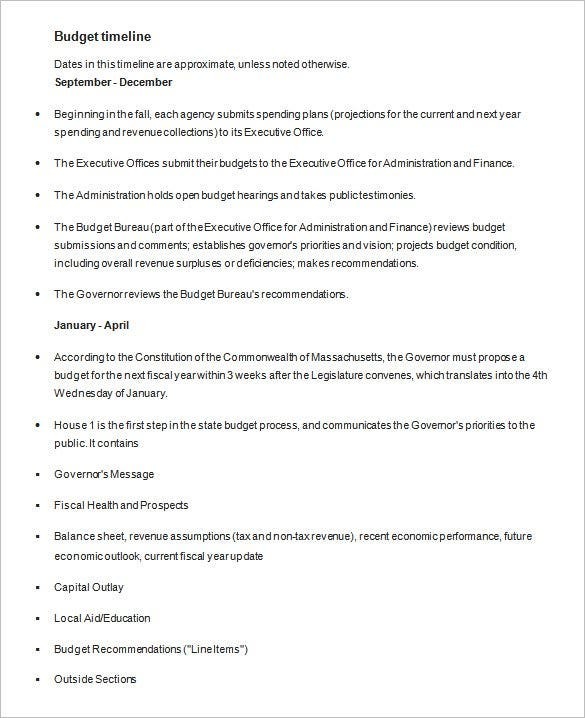 The months are listed on left side of the page while the right side documents the different stages of the budget process according to the months. 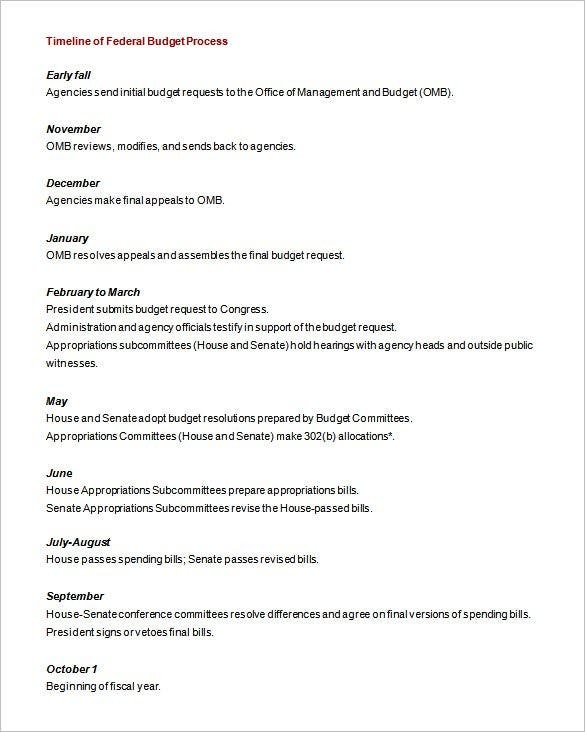 This budget timeline is divided into two sections. One is from September to December and the other is from January to April. The different stages of budget processing are presented in separate lines under respective sections. 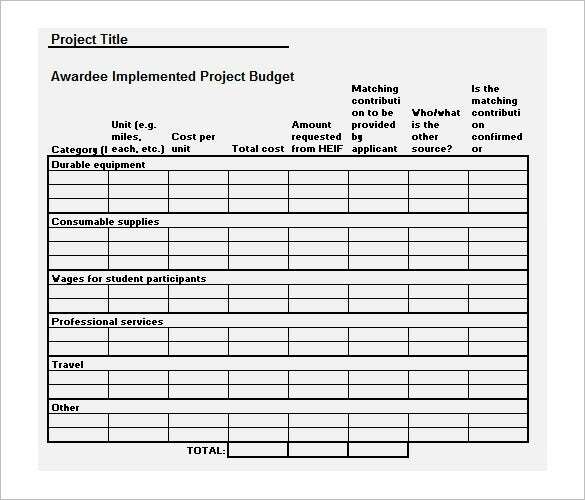 To use a budget timeline template, download a free sample in your preferred format download, create a shopping list for the year, edit them in an order depending on purchase urgency, and then use your shopping timeline template to record your purchase preference based on urgency and preferred purchase time. Download the best example and use it as suggested above. It is that simple.